SALT PAN, PANJU ISLAND VISIT BY BOAT, VASAI FORT, AFTER LUNCH 3 TO 5pm FUN AT RESORT, HORSE CAR, CAMEL RIDE, BEACH. 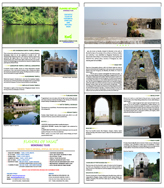 SALT PAN, PANJU ISLAND, VASAI FORT, ADI SHANKARACHARYA TEMPLE, BUDDHA STUPA, REPLICA OF SHANI TEMPLE, EMU FARM, NANDAKHAL CHURCH, AGASHI JAIN TEMPLE, ARNALA BEACH. VAJRESHWARI, GANESHPURI, HOT WATER SPRINGS, SWAMI SAMARTH MUTH, NAGESHWAR TEMPLE, ADI SHANKARACHARYA TEMPLE, DUTTA TEMPLE, REPLICA OF SHANI TEMPLE, EMU FARM. 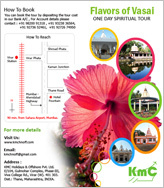 GANPATI TEMPLE, JIVDANI TEMPLE BY ROPE WAY, ISHWARPURI (MAUSOLEUM OF RISHI SANDIPANI - Teacher of Lord Krishna), MAHALAXMI TEMPLE, EKVIRA TEMPLE , 3 TO 5pm FUN AT RESORT, HORSE CAR, CAMEL RIDE, BEACH. PORTUGUESE TIME HISTORICAL CHURCHES, AFTER LUNCH 3 TO 5pm FUN AT RESORT, HORSE CAR, CAMEL RIDE, BEACH.